Early in my career, I was told that junior strategists are rarely hired, because it takes so long for them to start adding value. I made it my secret purpose to prove that person wrong—and succeeded! The single greatest challenge facing aspiring advertising talent is proving to others that you have the indescribable “it” factor that makes you great. Here’s how I used 18 months as an administrative assistant to do just that. 1. Make your intentions clear. 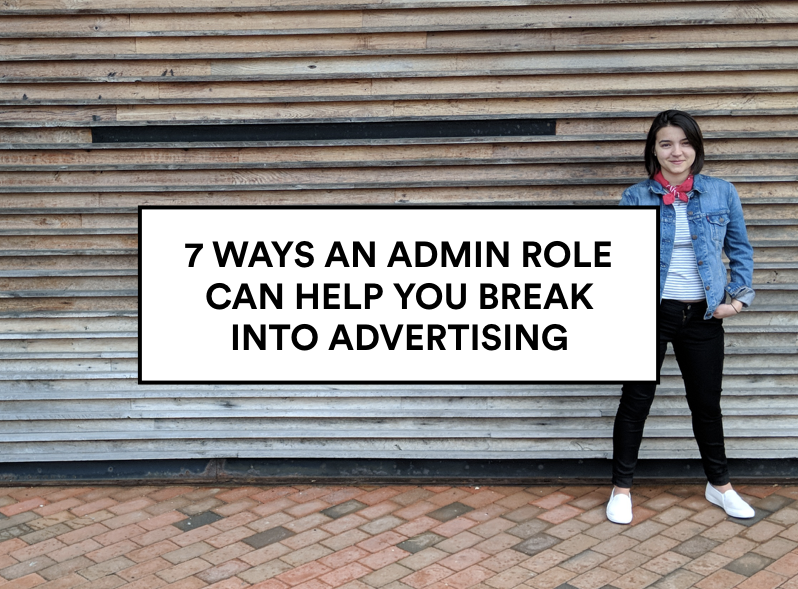 People choose an admin role for many valid reasons. Everyone at the agency should know that your goal is to transition into strategy (or your role of choice). Start early—you should find out during the interview process if it’s the kind of company that will foster your growth. You’re going to have access to documents, decks, emails—read it all. This is how you can observe writing styles, learn about projects, and essentially conduct research about what your role will be. But remember that confidentiality and discretion are essential to your role, and avoid sharing sensitive information with others. I will forever thank my younger self for devoting time to watch Keynote tutorials during my first year at work. Use your down time to learn every software program and research platform available to you. You’ll be quicker at using them once your time is mostly devoted to meetings, brainstorms, and client deadlines. 4. Build habits that will last your whole career. The skills you learn as an admin will benefit you no matter what role you take next. Learning to be organized, discrete, and attentive to detail will help you be self-sufficient and cool under pressure in the future. You’ll also have a much easier time managing your own travel and expenses, which most of my non-admin colleagues find very confusing. Most entry-level professionals are fairly removed from senior leadership. As an admin, you’ll be a familiar face to the people who run the show, which gives you a chance to prove how smart and dependable you are. Learning to interact with them will help you feel more confident once you start working directly with clients. 6. Learn how the whole agency works. A colleague once told me she wished she had started out as an admin to get better exposure to the whole company. You have the luxury of time to scope out the agency and figure out where you fit in. Even though I was most interested in strategy, I explored options like music production and account management before deciding. You’ll have the advantage of many people, as opposed to just one manager, holding the keys to your future. In this situation, it’s up to you to find the people who are going to put in the work to promote you. You need someone who will persist on your behalf, broadcasting your strengths and negotiating your new role. You’ve probably got what it takes to become a killer strategist (or whatever role you're aiming for). And since they can spring from any soil, consider an admin role as the first step toward bootstrapping your way into your dream career. Connect with Janine via LinkedIn and Twitter.